Relishing the very soft ground, Solemia denied Japan a first victory in the 91st Qatar Prix de l'Arc de Triomphe as the filly got up in the last strides to beat Orfevre in a thrilling renewal at Longchamp. Everything appeared to have gone to plan for Orfevre, who carried the weight of a nation's hopes. Christophe Soumillon dropped him out at the back, but he came cruising through in the straight and went at least two lengths clear. However, Carlos Laffon-Parias's four-year-old Solemia showed guts to fight back under Olivier Peslier to give the rider his fourth win in the race, snatching the prize in the shadow of the post. Masterstroke was third. Solemia was last seen finishing third behind Shareta in the Prix Vermeille but that one never showed up at all in the testing ground, while Camelot, Aidan O'Brien's 2000 Guineas and dual Derby winner, was given every chance by Frankie Dettori and briefly threatened but emptied out close home. Orfevre had broken from stall 18 and made up a tremendous amount of ground but became yet another agonising defeat for Japanese racing after El Condor Pasa, Deep Impact and Nakayama Festa. Laffon-Parias said: "She had a hard first part of the season so we gave her a two-month break and started to prepare her for the Arc. Soft ground is very important to her, but Olivier made the difference. I hoped she might get a place and obviously this is much better. "It's a big day for me to have all my family with me. It's my third runner in the Arc, but the first that I've had with a chance. Sometimes the jockey can make the difference and Olivier Peslier is the one who won the race. "To be honest I think the fillies are better than the colts and the older horses are better than the three-year-olds. "People were saying Camelot was unlucky in the St Leger and maybe it was the jockey's fault, but the winner of the St Leger is not really a Group One horse and maybe Camelot is not that good." Pierre-Yves Bureau, racing manager for the winning owners, who confirmed the Breeder's Cup as the next target, said: "It's just magnificent. She's such a nice, big filly and Olivier rode a perfect race. I'm very pleased for the Wertheimers because of the investment they have made over the years." Connections of Camelot are looking forward to another big season next year after a long campaign took its toll on the dual Derby winner. Aidan O'Brien's colt was given every chance by Frankie Dettori and briefly threatened to take a hand in the finish, but he emptied out close home and could fare no better than seventh behind Solemia. "He's something for us to look forward to next season, as he will remain in training. Hopefully he has a good winter and he could be something unbelievable next year," said the Ballydoyle handler. "It was very sporting of the lads to let him run, but he wants fast ground. Joseph (O'Brien) has always said he is a better horse on quicker ground and it's been a long, hard season. He's also come back minus two or three shoes. "We've stretched him in every way, pulled him left, pulled him right and an elastic band can only stretch so long at any time. Hopefully it will all go back together now and he's going to be something really special next year. "As far as St Nick (St Nicholas Abbey, 11th) is concerned, he will now go to Santa Anita for another crack at the Breeders' Cup." Dettori said: "It was just a long season took its toll. I had a perfect trip and he took me beautifully into the straight on the bridle, but just as soon I knew we were in trouble and in fairness to the horse he's been going for some time since the Guineas." The John Gosden-trained Great Heavens ran a creditable race in sixth, having only been supplemented on Thursday in the enforced absence of her brother Nathaniel. The trainer said: "It's very tough taking on the older horses, but I couldn't be happier with her. She ran her heart out. It's entirely the owner's decision (on whether she will stay in training)." Sir Michael Stoute's Sea Moon was eighth and the trainer said: "For a good-actioned horse he doesn't want the ground as puddingy as that. Ryan (Moore) said he never felt smooth on it at any point." Masterstroke is "unlikely" to run again this season after his fine run to take third. Trainer Andre Fabre will consult Sheikh Mohammed about plans for the Godolphin-owned colt but the French handler expects the three-year-old to be preserved for next year. 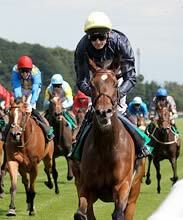 Masterstroke has won four of his seven races, but the Arc was his first start in the highest company. 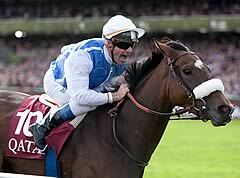 Fabre said: "We will see what Sheikh Mohammed says, but I think it would be unlikely that he will run again this year. "He ran a very solid race, he got through the ground well. "We haven't previously talked about the Breeders' Cup or Japan or anything so I can't see it." Fabre's second runner in the Arc, Meandre, fared less well and trailed home 12th of the 18 runners. "Meandre just didn't fire at all," said Fabre. "I'll see if anything shows up, but he just had no gas right from the beginning. "The ground might have jaded him but the jockey (Maxime Guyon) said he knew very early he wouldn't win."